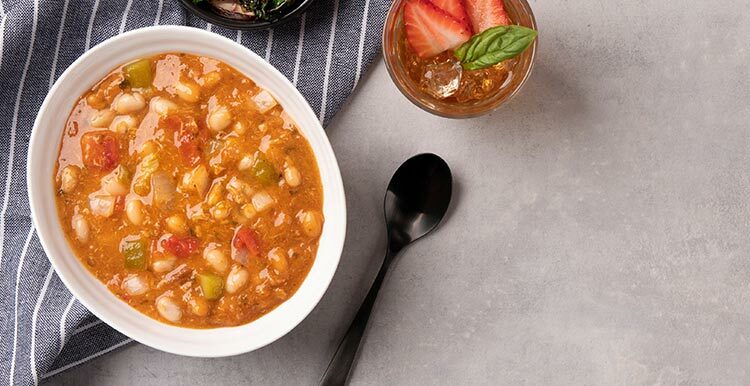 Spice up your lunch break with a savory nod to the southwest, featuring white beans, chicken, hearty tomatoes, zesty peppers and just the right blend of seasonings. Ingredients: WATER, WHITE BEANS, COOKED CHICKEN MEAT, TOMATOES IN JUICE (TOMATOES, TOMATO JUICE, CITRIC ACID, CALCIUM CHLORIDE), ONIONS, MODIFIED CORN STARCH, GREEN CHILI PEPPERS (GREEN CHILE PEPPERS, WATER, SALT, CITRIC ACID), AND LESS THAN 2% OF CHICKEN BASE (CHICKEN MEAT INCLUDING CHICKEN JUICES, HYDROLYZED SOY AND CORN PROTEIN, POTATO FLOUR, FLAVORINGS, AUTOLYZED YEAST EXTRACT, CARROT POWDER, TURMERIC), CANOLA OIL, GARLIC, SEA SALT (SEA SALT, POTASSIUM CHLORIDE), SPICE, YEAST EXTRACT, CHILI POWDER (CHILI PEPPER, CUMIN, SALT, GARLIC, OREGANO), LIME JUICE CONCENTRATE, CAYENNE PEPPER. Nutrients: WATER, WHITE BEANS, COOKED CHICKEN MEAT, TOMATOES IN JUICE (TOMATOES, TOMATO JUICE, CITRIC ACID, CALCIUM CHLORIDE), ONIONS, MODIFIED CORN STARCH, GREEN CHILI PEPPERS (GREEN CHILE PEPPERS, WATER, SALT, CITRIC ACID), AND LESS THAN 2% OF CHICKEN BASE (CHICKEN MEAT INCLUDING CHICKEN JUICES, HYDROLYZED SOY AND CORN PROTEIN, POTATO FLOUR, FLAVORINGS, AUTOLYZED YEAST EXTRACT, CARROT POWDER, TURMERIC), CANOLA OIL, GARLIC, SEA SALT (SEA SALT, POTASSIUM CHLORIDE), SPICE, YEAST EXTRACT, CHILI POWDER (CHILI PEPPER, CUMIN, SALT, GARLIC, OREGANO), LIME JUICE CONCENTRATE, CAYENNE PEPPER.